Helping the helpless is one thing that brings me the greatest pleasure in working as a volunteer here in Mongolia. Desperate need can usually be seen on the faces of many, but not so with Ariuna. Her face was well masked and gave no clue as to the reality of her critical situation. Not that she had come to beg assistance for herself, however. What she wanted I could not imagine, but her demeanor impressed me from the start. There she sat, not knowing quite how to approach me – a stranger and a foreigner. She didn’t speak English. Trembling a little, she began by suggesting that we pray. Her humble, simple prayer touched my heart and I was intrigued to know who this person was, where she had come from, and how I could help her. All I knew was that she was Temulan’s mother. She was the one we had given financial assistance to send her youngest daughter to our Adventist school. Even though Ariuna doesn’t have much money, she always tries to pay something towards her daughter’s school fees. Last time, she paid 160,000 tugruks (the Mongolian currency) even though it was very difficult for her. Temulan loves school and is enthusiastic to be involved in everything. She is also a shining example of what a good, caring, and obedient student should be. During the week of prayer I asked the students what they would ask God for if they could ask Him for anything. Temulan replied, “That He would change my character.” I had thought that it would have been more likely that she would ask for healing. Temulan has some kind of blood disease. When she does any exercise, she bleeds. For 2 years her mother paid for her treatment. Her doctor incorrectly diagnosed her illness and gave her the wrong medicine. Finally, she is improving, although she is not allowed to eat any meat. Vegetarian food is expensive and Mongolians are not used to it, which makes it very difficult for her. At least at our Adventist school, Temulan gets one vegetarian meal a day. Ariuna has health problems of her own but she carries on and tries to work hard in order to provide for her children, although she is really not strong enough. How all this came to be, I was about to find out. She told me her story. In June of 2000, when her mother and father died, Ariuna was left with three children and no home. She had no option but to move from one place to another. Her alcoholic husband was of no help and abused her constantly. Seeing her plight, someone brought her to a women’s refuge center, run by our Amazing Grace Church for women who were disabled or victims of abuse. There they learned to make trinkets or garments which they could sell to help support themselves. At the same time, Ariuna also learned of a God who loved her. For three years she prayed that God would somehow resolve her situation, but eventually her husband beat her so badly that she had no option but to leave him and escape to the refuge. She could stay there one week, but that was all. Eventually, an American family, who were working in Mongolia as volunteers, took her in and she stayed with them all summer. She was happy because lots of people were praying for her. It turned out that she was now managing a similar project to the one she first encountered at the Amazing Grace Center, which has since closed. 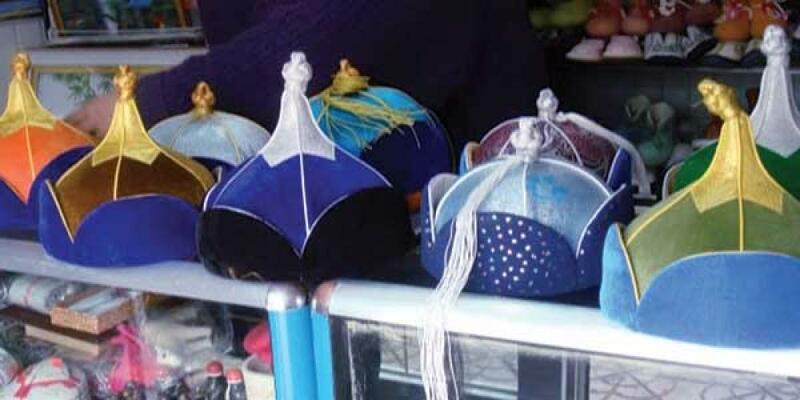 On her initiative, a number of women share rented premises and make high quality dells (traditional Mongolian clothing) and other trinkets that they can sell on consignment in Ariuna’s tiny tourist shop. But she needed some more capital to fund the initial purchase of materials the women would use. Fortunately, I was able to loan her a good amount of money that people had donated to us, to be used for whatever purpose we saw fit. We made a kind of micro-financing business contract which she would repay. If she could do this, then she would be eligible for another grant. The banks would charge an impossible 33 percent interest for such a loan, but seeing her need, I told her that three percent would suffice. Tears glistened in her eyes as we prayed God’s blessing on her efforts. Ariuna and Temulan live in a small ger (a traditional Mongolian tent-type dwelling) far from the center of the city, amid the smoke and pollution of the ger district where to cook or keep warm, everyone burns coal or wood. Many times Ariuna has no money to buy either. She and her daughter just get into bed and cover themselves with animal furs to keep from freezing in temperatures which can plummet to minus 36 degrees Celsius, or colder, during the winter. When I saw her the day after I loaned her the money, she was radiant. “Our ger was warm last night,” she said. And my heart was warmed. Coral Camps writes from Ulaanbaatar, Mongolia, where she and her husband Doug have been serving since March 2006. As a volunteer, Doug teaches cabinet-making skills, while Coral divides her time between being his personal assistant and teaching conversational English to some of the locals. She is originally from Australia and she and Doug plan to continue serving in Mongolia until March of 2014.